Saturday, April 27th 8:30-11:30AM - - - Click here for more information! Carolina CAT – a CTE Company operates 8 locations throughout Western North Carolina serving the Construction and Forestry industries. We are proud to be a part of the elite Caterpillar dealer network. Product offerings include full lines of new, used, and rental equipment. Carolina CAT – Power Systems, a CTE Company is a leader of distributed power for a wide range of industries. We carry CAT diesel and natural gas generators, as well as methane gas applications, Automatic Transfer Switches, UPS systems among others. Carolina CAT - Truck Systems is your one stop, total truck resource—maintaining, repairing and managing both Cat® and allied brand equipment. LiftOne, a CTE Company, is a full-service material handling dealership with 17 branch locations in North Carolina, South Carolina, Alabama, Georgia, and Tennessee. We are a proud dealer of Hyster, Yale, Utilev, Genie, JLG, among others. Pinnacle Cranes, a CTE Company is the North & South Carolina authorized dealer for Link-Belt Cranes; Manitex Boom Trucks; and Shuttlelift Industrial Carry Deck Cranes. Pinnacle Cranes is a crane service company offering crane solutions to all construction and construction related industries. 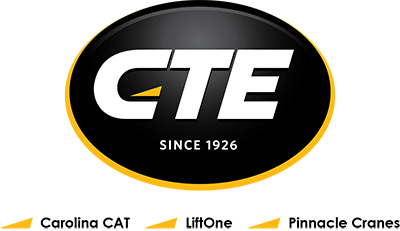 Since 1926, CTE has been committed to the needs of its customers by providing superior parts, service, sales and rental as a leader in industrial distribution. We support our customers through three operating divisions, all of which have highly skilled technicians, sales, and support employees. At CTE we become our customers trusted partner by providing the best service in the industry. As a Technician, you’ll have the opportunity to progress through our Career Development Programs designed to advance your skillet to a Master Level Technician. The Caterpillar Dealer Academy is a cooperative two-year college level student technician education program, which leads to an Associate’s Degree in Applied Science. Caterpillar dealers of North and South Carolina and Florence-Darlington Technical College, has developed the Caterpillar Dealer Academy (CDA) to train individuals in the specific needs of Carolina CAT and Caterpillar. In conjunction with Hyster – Yale, LiftOne subscribes technicians to the Certech™ certification program. With three levels of certification including certified, master and elite, it allows for career path progression. More importantly, it allows us to remain our customer’s trusted partner through an average of 40 annual hours of factory certified training per year. To meet the expected demand for these high-tech and hands-on careers, CPCC’s Heavy Equipment and Transport Technology (HEATT) program has partnered with Carolina CAT, the Caterpillar dealer for Western North Carolina, to establish the Carolina CAT Service Technician Program. I3™ certification training is centered around the vehicle systems manager of electric, warehouse equipment. The Integrated Intelligent Interface (or I3) is the central control module of narrow aisle and pallet truck. Through both on-board and laptop diagnostic training we meet the ever increasing demands of our customers. CTE offers a competitive benefit package to full time employees and their families. Our benefit program is an important facet to our commitment to preserve and improve the quality of life of our employees. Comprehensive benefits for medical, dental, and vision insurance with a focus on Wellness. Take advantage of the 401(k) plan with a company match, short and long term disability coverage and life insurance. We offer our employees paid time off, paid holidays and extra paid days off for new parents and marriages. In addition to on-the job training, professional training and resources, CTE offers tuition reimbursement. We are safety-first; everything we do at CTE is designed to take care of our employees. Investments in emerging technologies that allow our sales and support staff to bring the best possible experience to our customers. Defined career progression that supports development and growth over time. Education reimbursement and on-going training means our employees are on top of the latest technology and industry trends.